As Dalene West’s Exhibition draws to a close details of the last Quarter’s Programme for the Year of Faith Through the Arts is announced. To complete the Year of the Arts, we will be holding a photographic competition, open to everyone in Abergavenny, with prizes kindly donated by Shackleton’s. The theme is The Spirit of Christmas and there are three age groups—11 and under, 12-18, and adult. The closing date is December 29, but we hope people will send in their entries asap so they can be mounted on boards on display in St Mary’s, and in the other churches after judging. This is for amateur photographers only and entries are limited to one per person, no larger than A4 prints. All entries should be submitted as a print— sorry, we cannot take email entries. They will be judged on Friday, January 5 with the prize-giving on January 6th. Also in October, on Friday 13th, local amateur dramatic groups will present a specially-written production based on St Mary’s, in St Mary’s, with everyone walking around St Mary’s. This will bring to life the famous ladies buried there, exploring their lives and their importance to Abergavenny, through acting, speaking and music. One lady likely to feature is the Lady Gwladys, wife of William ap Thomas and known as the Star of Abergavenny, who was a patron of Welsh culture and arts. Cost of tickets is £5, and the profits will go to the Friends of Abergavenny Borough Theatre. In October, there’s the chance for members of the congregations—of all four churches—to display their works of art. These could include paintings, photographs, ceramics or collage. Depending on the number of entries, we may need to limit how many works each person can display.Congregation’s art In October, there’s the chance for members of the congregations—of all four churches—to display their works of art. These could include paintings, photographs, ceramics or collage. Jesse’s new Plinth and Chapel Altar on schedule. An update report and photographs on the progress of work by Joachim Tantaur have been received at the Priory today. The world famous Jesse effigy is to be moved to below the newly created Jesse Window and placed on a new plinth with a matching altar. Canon Mark Soady could barely control his excitement at the sight of progress, ” It is very exciting to see the end in sight of this impressive project in memory of my predecessor. Feast of BVM Celebrated and new Holywell Community Commissioned. On the Sunday (August 20th) in the Octave of the Feast of the Blessed Virgin Mary our celebration of our Patronal Festival came to its climax. With The Bishop of Monmouth (The Holywell Community’s Episcopal Visitor) Celebrating and Preaching we gathered for a Eucharist sung by our Holiday Choir and attended by Anglicans from across Abergavenny. In the presence of Sisters from the TyMawr Convent, the High Sheriff of Gwent, The Chairman of Monmouthshire County Council and The Mayoress of Abergavenny ; Joanna Hollins was Commissioned and Jennii Shaw was Re-commissioned as Lay Members of the Holywell Community. Also Fr Tom Bates appointment as Sub Prior was recognised prior to his formal Licensing later. Having heard a portion of the Rule of St Benedict read to them by the Prior, Canon Mark Soady, Bishop Richard placed the Community Pectoral Cross around the neck of each one of the Community in turn. Earlier the founder Concentor returned his pectoral cross and was admitted as an Associate Member of the Community. Br Simon acted as Sub Deacon of the Mass and read the Epistle on which the Bishop’s Sermon was based. (You can read the Bishop’s address here.) The Old Testament lesson was read by Associate Member David Fraser. Sr Joanna’s family presented the gifts at the Offertory. Fr Jeff Pearse, Assistant Curate Deaconed the Mass. The Service was followed with Lunch on the Prior’s Lawn. The Installation of Stephen Hughes CStJ , FCA, CF as the new Chancellor of the Priory of Wales for the Most Venerable Order of the Hospital of St John of Jerusalem will take place here at the Priory Church on Saturday, October 28th. The service will also see Daniel Lyons OStJ handed his Warrant as Commissioner of St John’s Ambulance in Gwent. The role of the Chancellor is to exercise responsibility and accountability through the Priory Chapter, for the efficient running of the Priory for Wales, with the assistance of the Principal Priory Officers, the Chief Executive and his Senior Management Team. St John (Wales) is the leading First Aid Charity and the Volunteers are arranged in to County Areas overseen by a County Commissioner. Daniel has served St John in a number of roles including National Youth Development Officer. He was promoted to be an Officer of the Order last June. St John Cymru Wales celebrates its centenary in 2018. Last year its 4,000 volunteers carried out 200,000 hours of volunteering at 3,500 events across Wales. 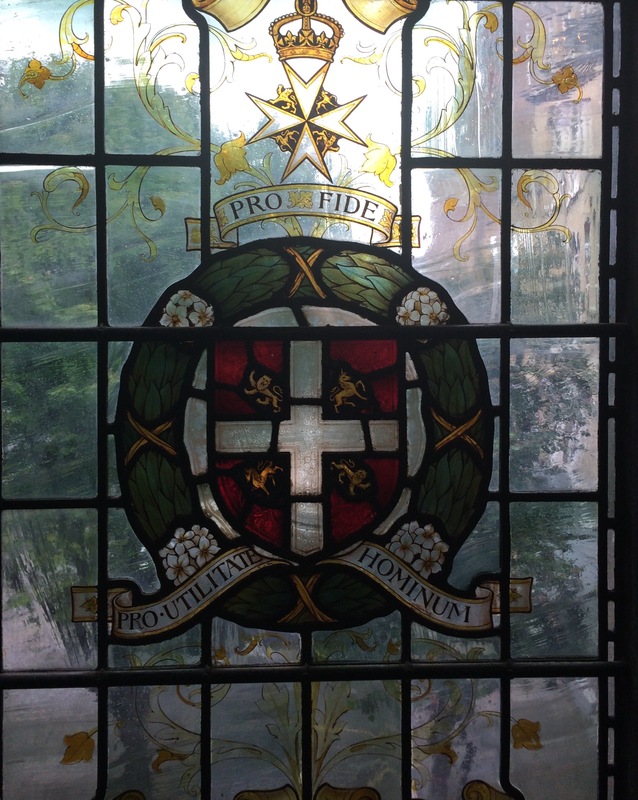 In addition to St John’s Ambulance the Order’s charitable work is carried out by the St John Eye Hospital in Jerusalem. The Order is a Christian Order, founded on Christian principles and all they do is inspired by Christian ideals. However they warmly welcome people of any faith or no faith, who are motivated to share in their mission. Our Vicar, Canon Mark Soady MStJ is Chaplain for the St John Gwent Council. The Service which starts at 3pm is ticket only, but there will be displays of St John’s activities across this site for the public to view. A week of celebrations is planned for the Festival of our Patron Saint the Blessed Virgin Mary. On Tuesday The Feast Day itself there will be aqcelebartion of the Holy Eucharist at 8.30am. On Sunday, August 20th at 11am the Bishop of Monmouth will Celebrate and Preach at a Sung Eucharist during which the Holywell Community will Commissioned for the coming year. The service will be sung by the Priory’s Holiday Choir. In attendance will be Civic Leaders and two sisters representing the Ty Mawr Convent. Following he service there will be a Picnic Lunch on the Vicarage Lawns. There will be no 8am and 9.30am Service next Sunday, but Evensong will be sung at 6pm. We knew that today was going to be demanding before it started, and we weren’t disappointed! We arrived at the cathedral at 9.00 and had to creep in as there was a morning Eucharist under way. Up in the Gundulf tower we set to rehearsing, aware that on Sunday morning rehearsal time would be very short, so we had four services to prepare. After 45 minutes, the music for today’s Evensong was sorted, so we had a short break whilst I went to set some things up on the organ. Tomorrow we have a visiting organist, but today we hadn’t, so it meant a swap of roles. I would play, and Simon conduct. Here’s what you see, sat at the console. We then went back to the tower and rehearsed all the music for tomorrow until it was finished – nearly midday! During the night, the rain had stopped….finally! We woke up to blue skies and even some warmth! The energetic took the opportunity to go off with Doug and indulge in some strenuous exercise before breakfast! Others decided to use the time to sleep in! Either way, we all gathered in the cathedral at 9.15 am for our morning rehearsal. Today’s evensong was to be unaccompanied, so we spent most of the rehearsal working “a capella”. More work on the Tallis – we’re getting there!